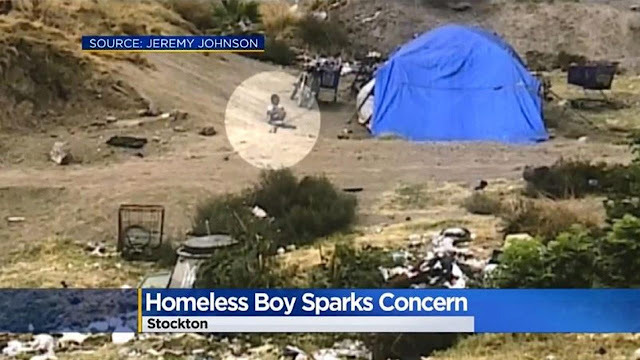 A little boy was taken from his father in Stockton, California, last week, after a picture of the child sitting at a homeless encampment went viral. The father is now fighting to regain custody from Child Protective Services. Suki’s father, Anthony Whigham, told KOVR, “I ended up with no job, no home, just like that.” Whigham said he and the child became homeless when the house they were previously living in burned down and he lost his job at the Old Stockton City Hotel. Whigham takes odd jobs and would leave Suki with caretakers at the camp while he was away. Suki was not attending school. The Whighams have lived in the camp for months, but after Suki was spotted in the photo, people reached out to the father to help. A woman named Andreen Galindo offered to watch Suki while Whigham went to work, saying she had a child the same age. Galindo posted on social media that the child was safe with her, but police investigated and showed up at her door with CPS to take the child into custody. Galindo admitted she has a CPS case against her from 2001. “That’s the violation they got me with was a person with an old CPS case can’t have someone spend the night there,” Whigham said. Whigham is protesting the decision to take Suki from him. Whigham explained to KOVR that part of the reason he and Suki were living on the streets was because many homeless shelters won’t accept men and their children. Whigham vowed to put his anger aside and to focus on getting a home and going to family court to get Suki back. “Daddy loves you, son. No matter what anybody says, you know Daddy always love you,” he told KXTL.